As if there weren’t already a multitude of reasons to love Andrew Robertson, he’s given us another one by offering to pay for his own flight to Kazakhstan to join up with the Scotland team. The Mail have reported that the Scotland captain was so eager to make the squad’s opening Euro 2020 qualifying match against Kazakhstan on Thursday that he offered to make his own way there – even though he has undergone surgery for a dental abscess. It looks like our man Robbo will have to sit that one out though, but will looks likely to play in Scotland’s game against San Marino on Sunday. 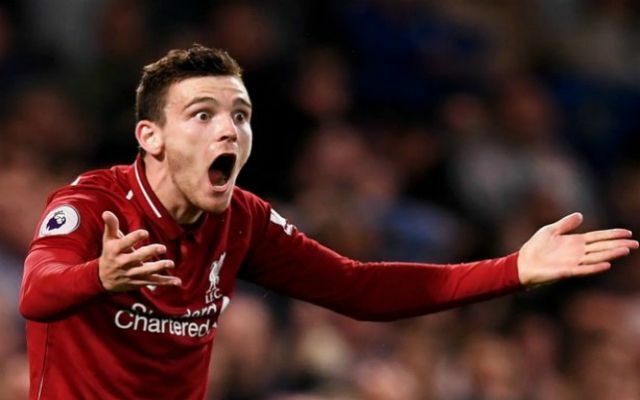 Andrew Robertson has been ruled out of Scotland’s trip to Kazakhstan after suffering with a case of ‘f*ck that, Liverpool are still involved in the title race’. Directly after the Fulham game, Robertson took a taxi to Heathrow having been unsuccessful in finding a dental surgeon that could operate on him in the capital. Making his way from London to Glasgow, the 25-year-old thought he might be able to be seen the same night up in Scotland – but, alas, he was forced to wait until Monday morning to be seen by a specialist. Even with all of the delay, the Glaswegian implored the Scottish FA to let him arrange his own flights to join up with his teammates. But his request was denied on the basis that it contravened their policy and went against medical advice. After being left disappointed, the Anfield fan favourite made do with second best and will be reuniting with the Scotland squad out ahead of their Sunday clash with San Marino instead.